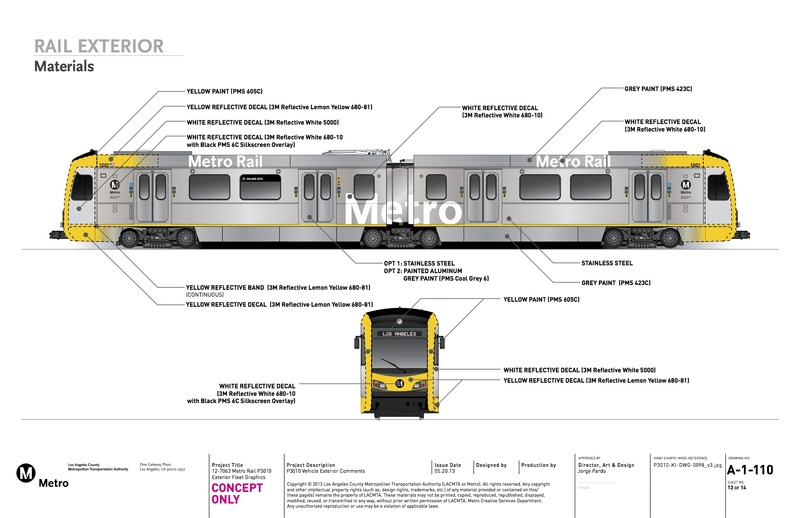 Drawings of the exterior of the new light rail vehicles prepared by Metro’s Creative Service department and formally submitted to Kinkisharyo. •The Board voted to approve two options to a contract with Kinkisharyo International for 97 new light rail vehicles to be used on the Crenshaw/LAX Line and to replace older vehicles in Metro’s rail car fleet. The cost of the options is $396,650,000. The initial contract — including an order for 78 light rail vehicles — with Kinkisharyo was approved by the Board in April 2012. As a result of its contract with Metro, Kinkisharyo is moving their U.S. headquarters from Boston to El Segundo. Kinkisharyo will also be assembling the light rail vehicles in Palmdale, which is expected to create about 250 full-time jobs. according to Metro. •The Board also approved the motion below by Supervisor Mark Ridley-Thomas for Metro to explore a small business mitigation program to help merchants during construction of the Crenshaw/LAX Line. Any chance we might see an officially blessed paper model of the P3010? Will the new trains have the seats in the cross seat pattern or aisle facing? Hopefully we can get rid of the cross seat pattern because the trains are getting crowded with more people riding the trains so we need aisle facing ones to increase aisle space. The side of these train cars look good hopefully they will have stainless steel doors. I wish the front didn’t have a curved look and instead looked more like the ansaldobreda cars. I think the curved look doesn’t match with the rest of the train cars. I am guessing the new Kinkisharyo trains ordered for Expo II and Foothill Extension will have the same look and design? Please keep the cross seat pattern. This says that this is drawing number 13 of 14 of these new cars. Would it be possible for Metro and the Creative Services department to release the rest? I’d love to see more images of what these new P3010 light rail vehicles are going to look like. I plucked that one because it showed the entire car. Let me see about the rest of the document. Can you show us what the used cars from St. Louis will look like? I vote for aisle seat pattern. New York Subway has them in that configuration and I like that the wide aisle spaces allow for faster boardings and offs rather than crowding between tight spaces and saying excuse me as you fight your way out of the exit. I also prefer the cross-seat pattern. Aisle-facing seats do allow more people onboard, but they also encourage folks to spread out and take 2, 3, 4, or more seats. Perhaps a good compromise would be to have a greater number of aisle-facing seats. Also, would it be possible to have more than one destination sign on each side of the car? If I was king, I would decree one destination sign above each door, but a decent compromise would be to have an additional destination sign located in the “mirror-image” window from where the sign is currently located. What I would’ve liked to see was NO GOLD PAINT- not when we have rail lines named with color. Trains need to be silver, gray, white or black so that passengers don’t associate the color on the train with a particular rail line… These cars are supposed to be universal. Changeable electronic headers or colored LED lights on the train should be the only colored indicators. I am of the opinion that form and function are equally important and maybe there is time to change the submital to Kinkisharyo. Just imagine the psychological conflict of waiting for the Green Line and seeing this yellow fronted train come toward the platform – it doesn’t make sense. Am I correct when I read that Los Angeles County will receive an entirely new fleet of light rail vehicles? This is great because its the same ride quality and configuration of railcars for all users. Also, good to ensure that all railcars will work on all segments of the system when they are integrated with the Regional Connector combining today’s Expo and Gold Line Eastside Extension today and the Blue Line and Gold Line Pasadena, not possible with today’s fleet with the overweight Breda cars and it not possible to couple any of the three types from different makers together. On another note, I do like the yellow, it appears to be a further integration of the yellow stripe in the previous livery and the current “WATCH FOR TRAINS!” This is a good way to increase visibility to autos, pedestrians, and onlookers (marketing) on the rather sterile all-aluminum, stainless steel, and painted gray railcars. The bigger seats will benefit every one. The same is true for the fully color digital destination signs. In closing, my only commentary is to consider experimenting with #1 seating configurations (larger, possibly bench, longitudinal layout) and materials (smooth hard seats), #2 adequate space to post maps and civic advertising (longitudinal overhead) like on buses, #3 interior digital signs denoting destination. Aisle facing pattern for me. With cross seating, you always have to move aside for the person sitting near the window when they get off and that becomes hard to do because the trains become too crowded. With aisle seating pattern, you don’t have to worry about that and makes getting off at a station easier. Besides, if this is for the Crenshaw Line that goes to LAX, you might as well have one with larger aisle space in mind because people will be carrying luggages with them. What are you going to do? Jam those suitcases into the cross seats? Imagine the difficulty of getting passengers with suitcases to try to go in and out of the trains under a cross seating pattern. LA Metro should think ahead how the people are going to be using the system. If it’s going to serve LAX, don’t you think it’ll be common sense that people will have large amounts of suitcases with them? And don’t you think they need to consider how they’re going to fit people with suitcases? Metro needs to think things ahead. If they go with a cross seating pattern, people are going to complain how there is no space for suitcases and how it becomes too crowded easily. Then they’ll have to spend more money to reconfigure them to an aisle pattern. You can see it clearly Metro has to do that. Rather than waste money, they might as well do that now when they order the new trains from Kinkisharyo instead of spending the extra money in re-configuring them later. Current Orange Line buses are silver, local buses are orange. Most people can deal with the conflict and still lead full lives. Silver Liner – As I said in my post, silver is good. As for the local buses, they are numbered routes so the orange is good and doesn’t matter. In fact, our buses are some of the best looking and most vibrant in the country. But you can’t compare local bus to the Orange Line BRT, they are different modes and the color is not a conflict because they are distinguished by mode, not route/color designation. I know people can lead full lives without these distinctions, but if your going to put out a product as large and important as this, might as well get the little things right… Proper designation is a choice and doesn’t really cost any more. No yellow paint. That’s an easy choice. Make a free choice for the customer. Here is a big problem with Metro’s branding and its failure to maintain consistency. Color coding from the beginning was a rather short sighted idea, and to complicate matters, colors were also assigned to bus routes and their operations. Today, we have red stripes on Purple Lines, Red Line Signage at Purple line entrances, and TWO physical “Blue Lines” (Expo is light blue), an Orange line bus line, which has silver buses; yet our local system is orange, a Silver Line, which at times also uses orange local buses, a Fleet of Blue “X” buses, and our infamous Red Rapid buses. Now if the Red Rapid buses were always “Rapid”, colors may work, but unfortunately the 40 runs these all day, and meanwhile, the 710, and actual Rapid, 3 out of 5 times will be an orange and what appears to be local line. When metro hires/appoints officials that actually care to use the lines outside of being snapped in a picture, they may understand how frustrating it is. As it appears, they do not care since the SAME MISTAKES are being made OVER AND OVER. I wholeheartedly agree with concerns on the color scheme. Make it as easy as possible for a first-time rider to use the system. Jason Burns – I agree that a move away from colors is good, i.e. Expo and Crenshaw. Wouldn’t these still need to be distinguished by color on a map? Like New York- although they have a great letter system, lines are also identified by color (A, C, and E are blue). I don’t think we can avoid colors unless we use dotted, hashed or dashed lines to identify routes on a map. @Jason, this is so true. I saw progress when Metro decided to put the little “E” inside of the blue cirlce. It would not be difficult to adopt this method for the rest of the system, maybe. (Gold and GreenLines may conflict if we use the expo pattern). It is definitely time to look at our system with a better sense. I suspect line lettering is coming (and I believe a while back the Metro Board directed staff to look into the options for conversion to letters), though I suspect we won’t see full implementation of line lettering until the Regional Connector opens as its opening will reorganize some of the rail lines: e.g. Expo Line + East LA Gold Line = E Line, perhaps? ; Long Beach Blue Line + Pasadena Gold Line = B Line, perhaps? That said, the Green, Purple, and Red Lines would seem to be ready to go right now. As someone noted earlier, the signage in the Red and Purple line stations is getting a bit long in the tooth and moving to a lettered system would finally necessitate a long-needed refresh. Back in the day, the schedules for all the rail lines were actually lettered. Then the letters quietly disappeared. Anyone out there remember which lines were lettered which way? Will we see this livery adopted across the rail fleet, or just on the newly delivered cars? It seems like it’s taking an awfully long time to roll out the “new” rail livery when the bus livery conversion is all but complete. Please please just number the lines! Numbers translate to many different languages and only lend greater clarity to navigating the system! 1, 2, 3… Do it by year built if the politicians are worried about who gets what number.